The Secrets of Christmas slot is a 5 x 3 online slot game from NetEnt that takes place in the window of Santa’s workshop at the North Pole. As you’d expect, it is very festive and you’ll see a few snowflakes gently wafting down as you play. The name NetEnt practically guarantees you’re going to get a good game, and they’ve pulled out all the stops to make sure the game is packed with festive detail. The focus is the free spins feature, but as you’ll see, this is no ordinary set of free spins. With a chance to win hundreds of thousands of coins, you never know how profitable this game could be. Twinkling Christmas lights, gently falling snow, gingerbread houses and playing card symbols designed to look like wreaths… you can practically smell the pine needles and the eggnog when you sit down to play this game. Whatever Christmas makes you think of, you’ll think of it here. If you’ve tried a few NetEnt slots recently, you’ll recognise the controls too. Everything has been given a red colour theme, including the red circle with the ‘i’ inside at the bottom left, which reveals the paytable. You simply use the arrows to select the number of coins to play per line and their respective values. You have low-value and high-value symbols here. The low ones range from A to 10 in the festive wreath design. The high-value ones bring good memories of Christmases past, from bells and candles to gingerbread houses, milk and cookies and a Christmas stocking. The golden bell is the best one to get, as five of these on a line bring 1,250x your line bet. Father Christmas is the wild and a large selection of festive toys is used as the scatter. These are both clearly labelled too, making it easier to identify them when they appear. Wilds substitute for all but scatter symbols and show up in the free spins as well. 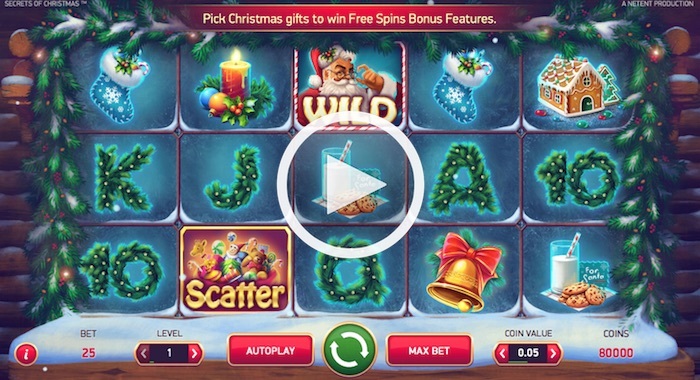 So, let’s see how many special features the Secrets of Christmas online slot can offer. It’s a great example of how Christmas slots can use the festive theme to deliver lots of surprises, and these begin when you find three or more scattered boxes of toys on the reels. When this happens, you get 10 free spins… except that’s not quite all. This is Christmas, so NetEnt gives you an opportunity to open some gifts. The number of gifts you get to open is the same as the number of scatters that triggered the free spins feature. You’ll choose from a selection of them scattered around near the Christmas tree. There are four bonuses you could get while choosing. The first bonus is some more free spins. You’ll get two, three, four, five or 10 spins on top of the 10 you’ve already won. The second bonus is the chance to get a wild reel for the duration of the spins. The second reel will be wild if you pick this bonus, but if you pick it twice you’ll have the second and fourth reels going wild for your spins. Prizes aren’t multiplied during the free spins feature unless you get a 1x or 2x multiplier as one of your picks. Whatever you get is added to the original 1x multiplier to determine your prizes during the round. Finally, you could pick a gift that gives you extra wilds. Either candles or bells (or both if you’re lucky) will transform into wilds for the free spins. As you can see, even if you get the minimum of three gifts to open, your free spins experience is going to be more than just the average one you’d expect elsewhere. The coin values for the NetEnt Secrets of Christmas online slot range from 1p to 50p, but you can also go from one to 10 coins on each payline. That makes your minimum bet 25p and the biggest one much higher at £125. You can’t deselect any lines but at 25p per go it should be an affordable game for most people to play. The first screen you see when the game loads reveals you can win up to 350,000 coins playing this slot. This is possible in some of the special game features. The biggest single prize for five bells on one line is 1,250 coins. You get a generous RTP in this game too, reaching an appreciable 96.7%. We’ve seen several new Christmas slot games already this year, and this ranks as one of our favourites. With NetEnt behind the wheel (the sleigh?) 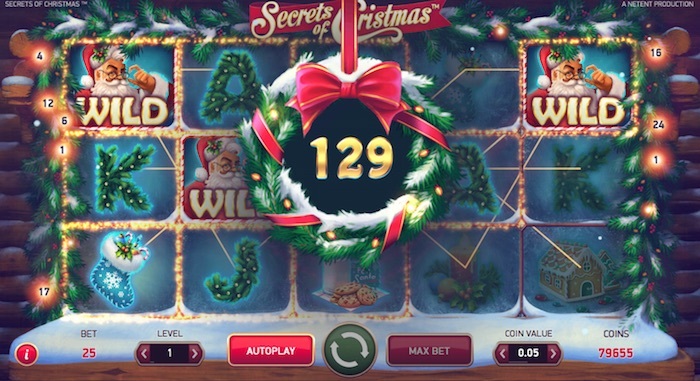 you’re assured of a fun time, and the Secrets of Christmas slot delivers on all its initial promises. If you’re not in the festive mood yet, this game will change all that. It did with us, and we haven’t even finished our Christmas shopping yet!